Active Campers make demountable units for pickups ('ute style') and flat-bed trucks ('flat tray'). One model of demountable, the TrayTop, designed for flat-bed trucks and off-road driving. AuSlide Campers offer the same range of campers and services as the U.S. company Panther Campers. Not surprisingly both are owned by Superior RV Manufacturing Inc based in Vancouver, Washington. Austins Caravans & Trailers describes itself as a "great caravan and leisure centre, plus!" - the Gift Shop certainly looks like it's worth avoiding at all costs - but, if you click on 'Products' and follow the first link, you'll find information about their 'Austin-Star' slide-on camper. Grandcruiser Caravans will build a hard-side demountable (they call it a 'slide-on') for virtually any kind of truck. As so often with small manufacturers, they will only custom build to order. Well named, Innovan produce a genuinely innovative slide-on camper (for flat-bed trucks) and a similar caravan. Constructed in glass-fibre they look as though they could take just about anything you could throw at them. Islander Campers manufacture a range of demountable campers in both hard- and pop-top configurations. The range includes the 3-metre 'Holiday', designed to exploit the benefits of the Quick Hitch system mentioned on this site's chassis & bed modifications page. A welcome return of the Millard website (previously featured on the 'In Memoriam' page) and its slide-on camper. Millard are one of the oldest Australian RV builders. Mustang Campers' no-nonsense website offers four slide-on demountables - essentially two different layouts in two different lengths. Another manufacturer producing just one model of demountable, in this case the Tray Topper, but in variations for single, extra and double cab pickups. 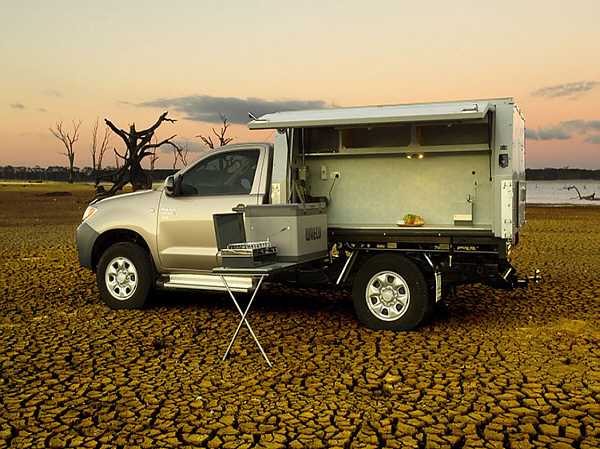 Ozcape Campers manufacture a five-model range of demountables, from basic to luxurious, but all for flat-bed trucks. Trailblazers RV custom manufacture a wide range of recreational vehicles including both hard-side and pop-top demountables in various sizes. Demountable camper units for single or double cab trucks. In typical Australian style it's flat-beds only though. TurtleBack describe their demountable as 'a glide-on camper'. Wombat Conversions, among many other types of recreational vehicle, will custom build a pop-top, 'glide-on' camper for either a ute- or tray-bed truck. The curiously-named 3-Dog-Camping company produce an equally curiously-named ute back camper, the 'Deefa'. • rv.net - All the links above are to sites that I've happened across, and taken an interest in, as I've been looking around the web. If you're looking for a more comprehensive listing of Australian manufacturers, this thread maintained by Robert Ryan on the RV.net site may offer it. There must be companies building demountable campers in many other countries but all I've managed to find are links to manufacturers in Australia and South Africa where, as you'll see, climate and vehicle preferences have a strong influence on the interpretation of the demountable concept. I try to check these links on a fairly regular basis but if you find dud links here please let me know.